Benjamin Joseph Salmon has been on the national stage for more than a century. Though his first appearances were treated with revulsion during and immediately after the US' entry into World War 1, he constantly lived and preached Jesus' message to love all people as Christ loved him. 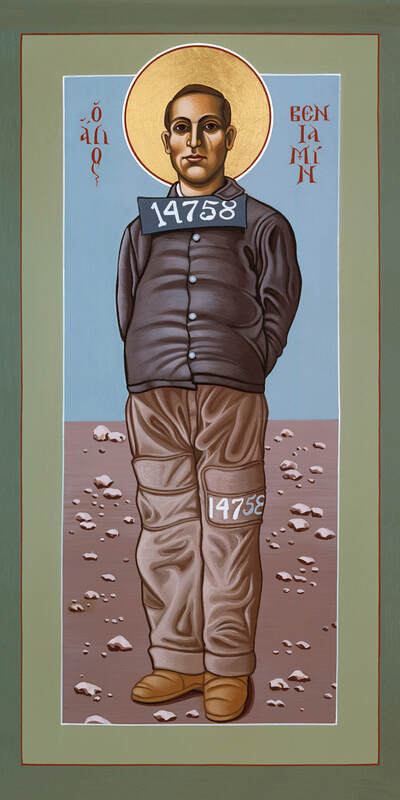 For that he suffered recriminations from his beloved Catholic Church and physical and mental torture in US Army prisons. Ben conscientiously objected to killing a fellow human even though the US Catholic Church was completely supportive of war. The Church's backing of the war led the US government to deny conscientious objection claims by Catholics. Many people see Ben's life, faith, and suffering as those of a saint and are actively working to petition the Catholic Church to formally recognize Ben Salmon as a saint. The Church's declaration of sainthood follows from a formal process that must be initiated by a diocesan bishop. In 2013 a group of Ben Salmon supporters met with Archdiocese of Denver Judicial Vicar Giovanni Capucci to promote Ben's sainthood. The Very Rev. Capucci charged the group with showing that a considerable following of people, or a 'cult,' consider Ben worthy of devotion as reported in the Denver Post. Ben's following has been growing and people are now petitioning Archbishop Aquila of Denver to open a cause (beginning the formal process) for Ben. 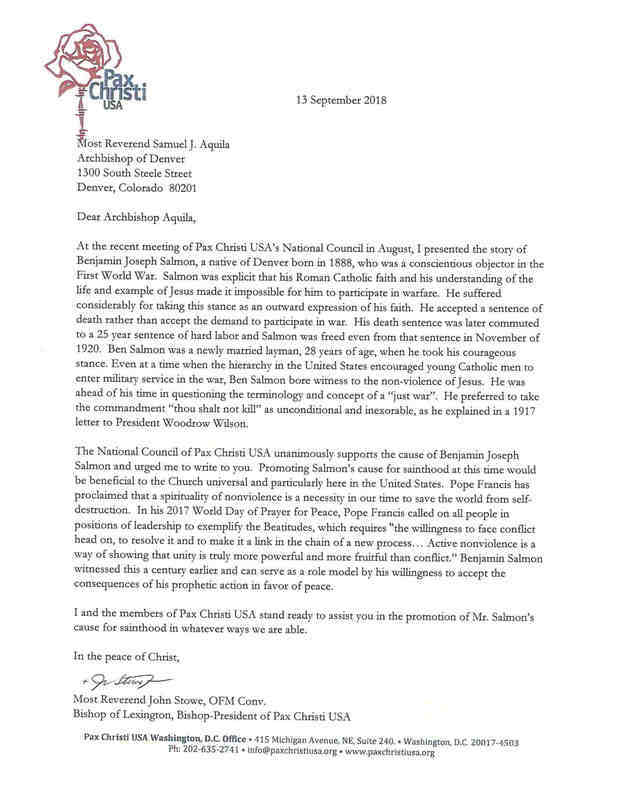 The National Coucil of Pax Christi USA has eloquently written to Archbishop Aquila urging him to promote for sainthood Ben Salmon, who was born, baptised, schooled, worked, and ran for office in Denver up until he was arrested and sent to Ft. Logan, Colorado at age 29. The Friends of Ben and Franz hope that you will browse this site and learn of Ben Salmon and if you are convinced that his life and witness are examples that should be followed and emulated, please join the 'following' and sign the online petition to Archbishop Aquila found by clicking the button below.